A protester chants slogans during a demonstration in Athens, Greece, on May 6, 2016. Responding to a sudden new attack of austerity programs, unions in Greece called a two-day general strike and mass demonstrations beginning on May 6 that saw hundreds of thousands of workers walk out and take to the streets. Despite the strong strike and protests, the Greek Parliament voted to approve the hated new austerity measures on May 8. This current class struggle is a continuation of the battle between the Greek workers and the big European banks, allied with the Greek rich. Workers, especially in the public sector, closed schools and universities and kept public transportation to a minimum by stopping railways, trams and subways in the capital. Even by May 9, ships and ferries were still at anchor in the ports. Water and electricity services as well as telecommunications were handled by a minimal workforce, and only emergency health care services were maintained. Journalists also joined the general strike, so no newspapers were published over the weekend, and newscasts on radio and television were limited to two reports, dealing only with the strikes, at noon and in the evening. A coalition of the Syriza and Anel parties, which won last September’s elections, leads Greece’s government. Prime Minister Alexis Tsipras of Syriza had first been elected in January 2015 by voters who believed his party would fight austerity. However, working with the European Union, the International Monetary Fund, the European Central Bank and the European Stability Mechanism, these parties agreed on new cuts that especially hurt the working and poor people of the country. For example, the new austerity package includes another hike in the value added tax — a type of sales tax — to 24 percent. It reduces the amount of income exempted from taxes, while charges that workers must pay for pension insurance were raised for the 14th time since the crisis started six years ago. Currently, a third of workers in Greece are unemployed. The Tsipras government moved the vote in Parliament to May 8 to try to slip the austerity measures through before meetings with European Union finance ministers in Brussels on May 9. The EU ministers may demand even harsher cuts. Tsipras cynically defends the current measures as “social reform” in this new betrayal. His grouping within Syriza succeeded in purging the party’s left wing before last September’s election. All remaining Syriza representatives voted for the new package. The striking unions include the All-Workers Militant Front — which is close to the Communist Party of Greece (KKE) — and also the more social democratic union confederations. Together, they represent 2.5 million workers. 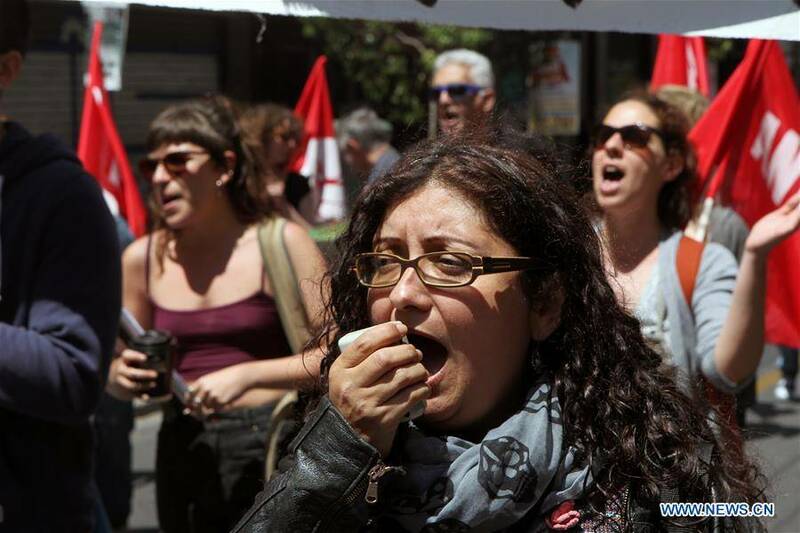 The unions denounced the new austerity program as “a guillotining of the pension system.” The two different union groups held separate marches and rallies through downtown Athens, the capital, and kept up protest actions throughout the weekend. Quotes and strike report from a May 7 article in the German daily newspaper Junge Welt by its Athens correspondent Heike Schrader. 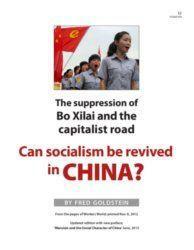 Can socialism be revived in China?